‘Tis the season for marriages and commencement ceremonies. And with this season comes tons and tons and tons of food. So here are some tips to eat smart while eating out at graduation parties and weddings. 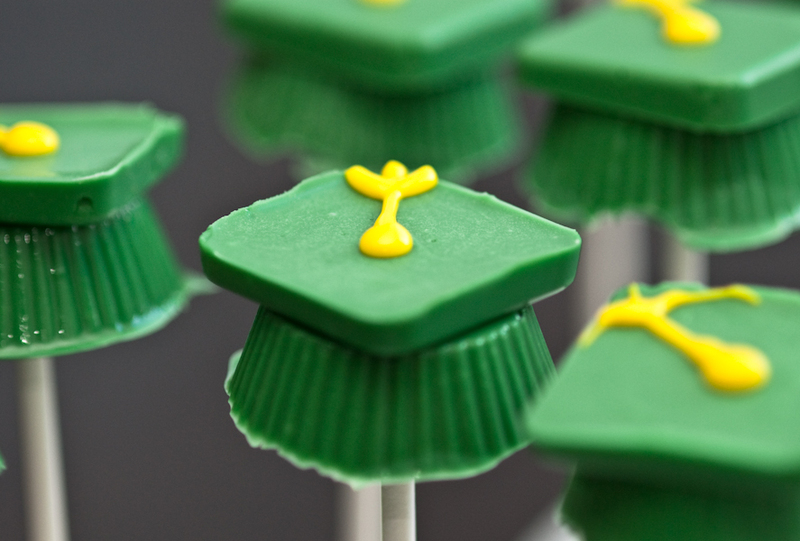 Sweet treats such as these graduation cap chocolates can be enjoyed in moderation – try to eat just one per party if you only have a couple of parties to attend. – Start the party off right by taking a smaller plate. Choosing smaller plates trick us into thinking that we’re enjoying more food than we actually are. – Survey all the available choices, and then decide what and how much. It can be overwhelming to see a buffet table loaded with delicious dishes, and more options can easily lead to overeating. – Fill up about half the plate with fresh veggies and fruit. Skip the dips if you’re worried about extra calories. Just one tablespoon of regular ranch dressing, for example, may have 75 (or more) calories. – If you’re looking forward to the main course at the wedding, go easy on hot and cold hors d’oeuvres, or plan them into your meal by being mindful of choices and portions. Appetizers such as cocktail shrimp and vegetables are lower in calories, so try to choose those items. A three-ounce serving of shrimp – about the size of a deck of cards – has just 85 calories. – Creamy sauces and dressings also add calories, and can always be asked for on the side. – Be aware of alcohol consumption during the meal, as this can also lead to overeating, plus alcohol adds calories. For a reminder of moderation, check out our earlier post. – Practice mindfulness of physical hunger and fullness cues as well as reasons for eating. Parties often involve “grazing” making it harder to determine our level of satisfaction. A busy and fun social atmosphere may also impact our intake. How Stacey Got the Shot: on the dining room table next to the window at midday. Used the fabulous 105mm f/2.8 macro lens at f/3.3 and bounced the flash at 1/200 of a second. These caps are a great idea. Very creative. We had nothing like this when I graduated.